From time to time, we like to host interactive product tours and webinars to show you how Lenovo can be a difference maker for your business. Sign up here to receive notifications of upcoming events. By clicking 'submit' you are agreeing to receive marketing communications from Lenovo and are providing express consent to receive these messages. You may unsubscribe at any time using the link included in each email message. Get early access to our first ever SALE on the new line of ThinkPad T series laptops. Shop now for big business savings! Save up to $787 on Yoga 2-in-1 Laptops. An easily manageable, tower server. Optimized for businesses that require infrastructure solutions that can tackle any day-to-day computing needs, from email to basic filing, printing and accounting. Details Matter. They put the "small" in small business. 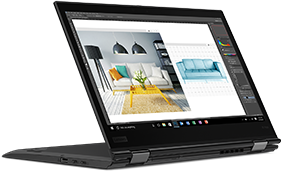 Lenovo Pro provides exclusive offers on products and solutions personalized for your needs—combined with quick, hassle-free purchasing. So you can have the tech that delivers for your customers, in your own special way. We love a great small business story. But we really love hearing from small businesses who believe Lenovo products have made a difference for them. Do you have a story to share? Tell us about it. Have a product question? Need help finding something on the site? Our Small Business Pros are glad to help out. Need some help placing an order? No problem. One of our Small Business Pros will be glad to get you set up in no time. designed to handle all of your business needs. Enjoy savings on our most powerful business machines. Don't miss your chance to Shop Now and Save Big! Dive into deep discounts on our most powerful business servers. Configure your server today! Shop a variety of compatible tech devices to assist with all of your business needs. Save on mice, keyboards, webcams and much more! Take your business to the next level with LenovoPRO. Save more as you buy more with exclusive offers, personalized products, solutions and business financing. Already have a Lenovo ID? Please choose secure log in and enter your Lenovo ID credentials. With its stunning new look, the ultralight ThinkPad X1 Carbon merges elegant design, seamless responsiveness, and legendary durability to create the ultimate in mobile productivity. Now harness quad-core performance for the first time in a Lenovo Ultrabook® with the ThinkPad P52s mobile workstation. This powerhouse boasts 8th Gen Intel® Core™ processors, pro-level NVIDIA® Quadro® P500 graphics. With its 360-degree hinge, the ThinkPad X1 Yoga moves with you. The phenomenal HDR display option delivers 100% color gamut for vivid and true-to-life visuals. The integrated ThinkPad Pen provides perfect outlet for your creativity. Lenovo offers options to enable fast credit decisions to make it easy for organizations of any size or type to purchase the solutions they need today. All LenovoPRO members now receive 1 year of Premier Support with any Think Laptop. Premier Support offers your business advanced-level techs, end to end case management and faster, first-time resolution. Learn how Lenovo Vantage can help your business with diagnostics. optimized settings and improved security. Support, Personalization, Innovation, Financing & Resources. See how LenovoPRO can be a difference maker for your business.